Home > Green Christmas > Unwanted Christmas Gifts: What to Do? It is the same every year – you unwrap your presents on Christmas morning and undoubtedly there are a few that you’re sure must not have been meant for you. Have you ever worn a jumper like that in your life? Does your Aunt really think you want to read a book on cross-stitching? And when exactly are you expected to use the teapot in the shape of a tortoise? It is, of course, the thought that matters; the idea that someone thought enough of you to buy you something as a token of their affection is lovely. But putting that gift in the back of a cupboard and never using or wearing it is just a waste. So why not put them to some good use? A great way to make use of unwanted gifts is to pass them on. If you received something at Christmas that really is of no use to you then why not keep it safe and give it to someone who would really appreciate it for a birthday or for next Christmas? That way you get to give the gift to someone who will really like it and it won’t go to waste. Of course make sure you remember who gave you what so you don’t end up giving it back to the person who bought it for you in the first place! Another option for making use of those gifts that you really don’t want is to swap them. Chances are someone in your circle of friends or at your workplace will have received an unwanted present too, but while they may not like the CD they were given, you may love it! While that teapot may be of no use to you it could fit perfectly with your work colleague’s collection. So why not offer to trade gifts? That way you’ll both end up with a gift you really want and neither gift will go to waste. You can even hang on to your unwanted gifts and use them next Christmas is a Secret Santa Swap – all your colleagues can bring in an unwanted gift and you can have a mass trade. In times when money is a little tight this is an economical way of having Secret Santa too! If you receive a present that you aren’t particularly fond of then you could put it to good use and donate it to a charity shop. Charity shops raise money for some great causes and by donating unwanted gifts to a charity shop, you can do your bit to help. 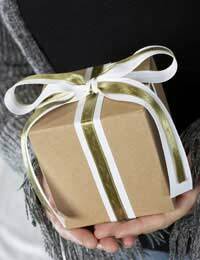 Finally, while you’re wondering what to do with unwanted gifts you’ve received, there’s a chance someone you’ve given a gift to is having the same dilemma! When you buy gifts for people, try and think about what they really like rather than what you want them to like! If you’re buying for the person who has everything why not donate to charity in their name? There are plenty of schemes out there which will organise this for you. Why not organise a party - where all your friends and colleagues can bring in an unwanted gift? Put them all together in themed piles and make a batch of your own christmas hampers - your unwanted book on cross stitch may go perfectly with someone elses's unwanted embroidery kit. You can then raffle them off or take them to a local hospital for gifts to be distributed.